This little Tomica model had me scratching my head for ages. The “Canon” racing livery looks real enough. The names of Tony Dron and Richard Lloyd are certainly familiar and connected to both Porsche and Canon Racing. But a 928 Racing Car? No way, there’s no record of that ever happening. I had bought this model mint, loose for GBP 5.00 back in 2004 in the UK. There were plenty of them going around, and with the names of the British drivers on the side, it was safe to assume that this was a British Promo model. And there it is, a 1981 Racing Porsche, #75, driven by Dron and Lloyd, in exactly that livery. Except it’s a 924 GTR, not a 928. 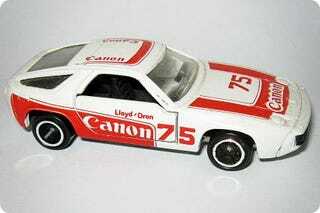 It seems that back in ‘81, Canon commissioned Tomica to make a Promo model of their British racing car. But Tomica didn’t have a 924 casting - so they used the 928 casting instead. Problem solved. Simpler times.